Edinburgh is world renowned for its architectural treasures, but there are many that even the locals don’t know about. 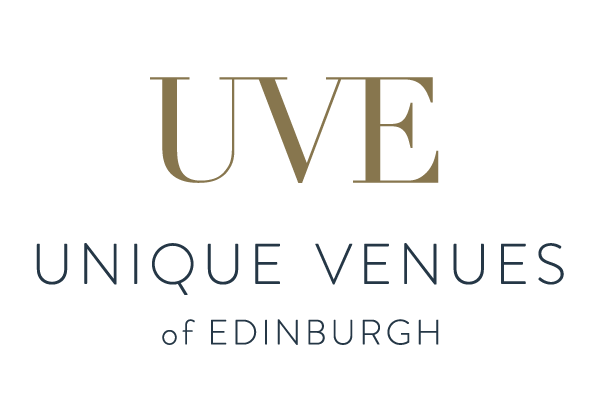 With breathtaking views across its own grounds and onwards to the Pentland Hills, the Mansion House at Edinburgh Zoo is a haven of tranquility in a truly unusual location. 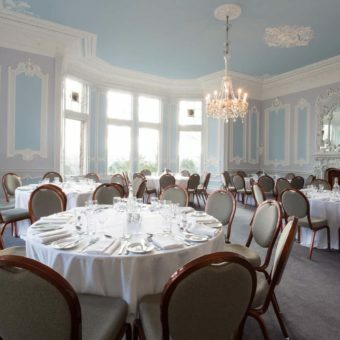 The Mansion House boasts many function rooms, but the MacMillan Room is a masterpiece of understated serenity. Flooded with light from a vast bay window, the room is decorated with calming hues of Wedgwood blue and grey. 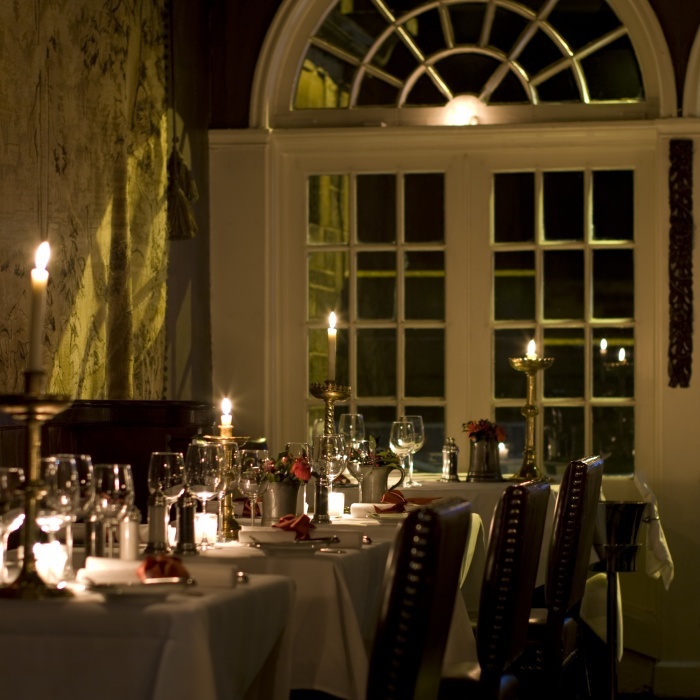 The sophisticated air is heightened by ornate plasterwork, sparkling chandeliers and an antique fireplace, creating a feeling of refined splendour. 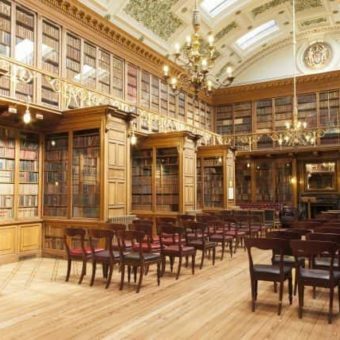 The Great Hall at the Royal College of Physicians is probably the best known of the venue’s function rooms, but equally impressive is the New Library, dating back to 1870s. The magnificent wood panelled bookcases of the New Library rise to meet the surrounding gallery, which in turn is lined with bookcases filled with ancient tomes, and gives way to an ornately decorated curved ceiling. The feeling of warmth created by the light reflected from the mellow oak is further enhanced by the many windows in the ceiling through which light streams during the day or stars can be seen on a clear night. 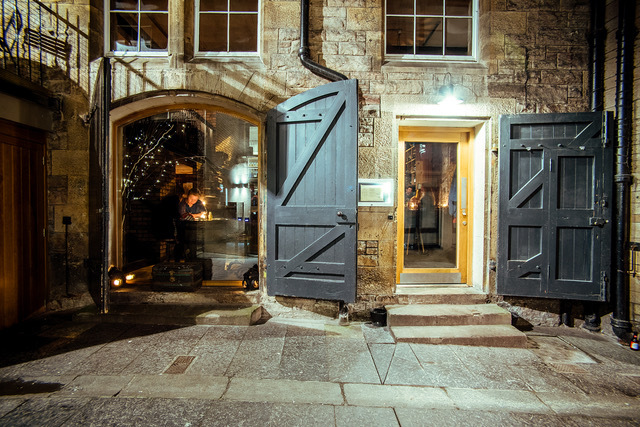 A stone’s throw from the hustle and bustle of Princes Street, the Merchants’ Hall, built in the 19th Century, is the home of The Company of Merchants of the City of Edinburgh, one of the city’s oldest business organisations. 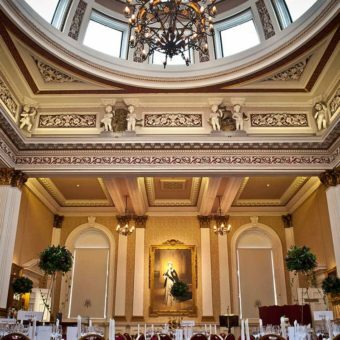 The largest of the function rooms within the neo-classical building is The Hall, where the gilt topped pillars reach skywards to intricate plasterwork culminating in a magnificent domed ceiling. The feeling of occasion when entering the room is enhanced with golden framed oil portraits and a Minstrel’s gallery above the entrance door. 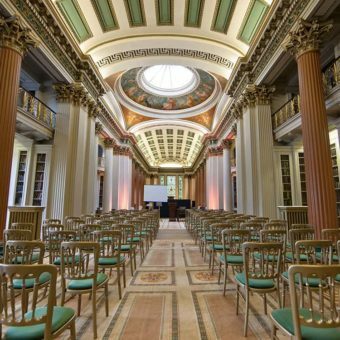 Situated on Edinburgh’s Royal Mile, the Signet Library is considered one of the finest examples of Victorian architecture and remains the home to the Society of Writers to her Majesty’s Signet to this day. The Upper Library, reached by a sweeping staircase, has soaring Corinthian columns reaching to a spectacular cupola with a depiction of Apollo and the Muses. The ornate gilt balustrade surrounding the balcony heightens the feeling of opulence, whilst original, and often quirky features, enhance the charm of this delightful which was described by King George IV as “the finest drawing room in Europe”. 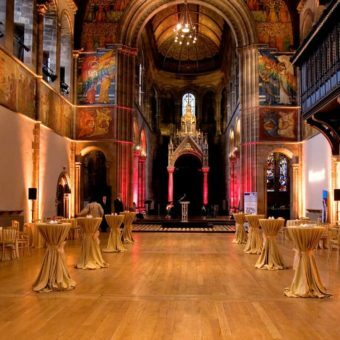 The dazzling beauty of the neo-Romanesque architecture of Mansfield Traquair is undeniable when dressed for a celebration, but those who visit during one of the venue’s many open days will marvel at the results of its painstaking restoration. The towering barrel vaulted nave is adorned with richly coloured murals from the Old and New Testaments painted in the late 1800s/early 1900s by Phoebe Anna Traquair, the first woman elected to the Scottish Academy, with the chancel arch depicting the Worship of Heaven. 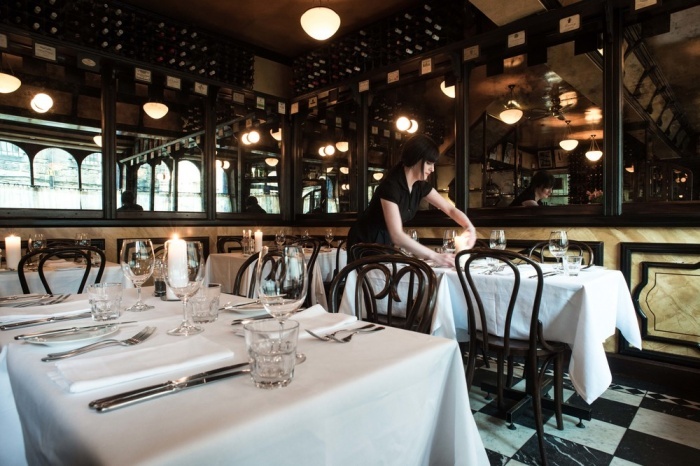 Adding to the contrast between the brooding exterior and warmth of the interior are the opulent stained glass windows and mosaic tiled floor, which combine to create “Edinburgh’s Sistine Chapel”. As the former home of a wealthy merchant, Dundas House was acquired by the Royal Bank of Scotland in the 1800s. 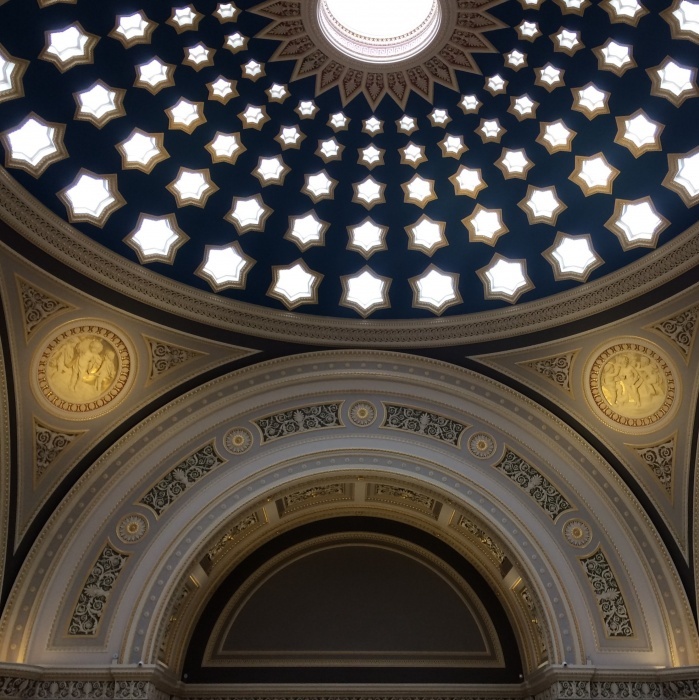 During the radical alterations made by the bank the magnificent banking hall was created by architects Peddie and Kinnear. The most striking feature of this cavernous room is the domed ceiling, which is pierced by 120 gold edged stars increasing in size before reaching the ornate plasterwork or the grand arches which surround it. Recent restoration of the banking hall uncovered a section of the original floor tiling, laid in around 1860, which has now been covered with a glass floor allowing customers to see the Victorian tiles below. 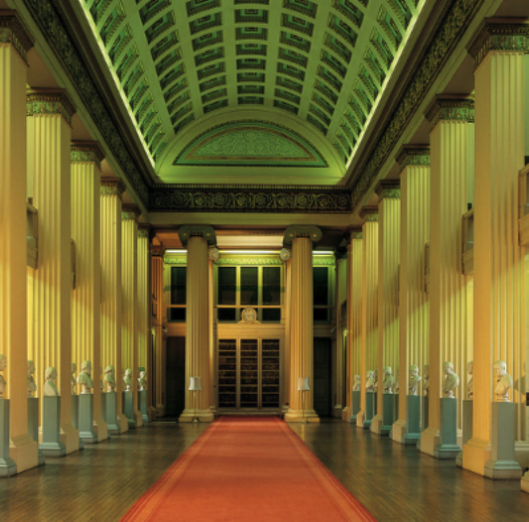 The Playfair Library, on the southern side of the Edinburgh University’s Old College quadrangle, was used as a working library until the 1960s when the University moved its main collection from the site on South Bridge to George Square. Reaching nearly 200 feet in length, the library’s most striking feature is the magnificent coffered vaulted ceiling supported by a series of fluted columns. Shelved alcoves run the length of the library, with busts of notable 19th century professors adding a feeling of austerity to the noble atmosphere.